Here we are at Capitoline Hill at the famous statue of Emperor Marcus Aurelius. This statue has born witness to the city for almost 2,000 years, and it will hopefully see another 2,000 years come and go so future generations can enjoy the sculpture. October 2013, panorama from 4 horizontal images, additional exposures for highlights, focal length 16mm, aperture f/11, shutter speed 5 seconds, ISO 200, tripod. The man behind the statue was Roman Emperor Marcus Aurelius. We often imagine Roman Emperors as adults ruling, defeating, feasting and doing other spectacular things that the strongest leaders in the world are want to do. Emperor Marcus Aurelius did all of those things, but he was quite multi-dimensional character. As a boy, the story goes he was always very curious and interest in philosophy. At one point he even dressed like philosopher and slept on the bare floor – much to his mother’s chagrin. This desire to learn and seek of knowledge would serve him well, and he even left behind readings which are still popular today. One famous quote of his is “It is not death that a man should fear, but he should fear never beginning to live.” Even if you are sceptic about Roman Emperors, it is hard not to admire some aspects of the character of Marcus Aurelius. Before capturing this photo, I had already done a morning photo shoot at the Roman Forum. 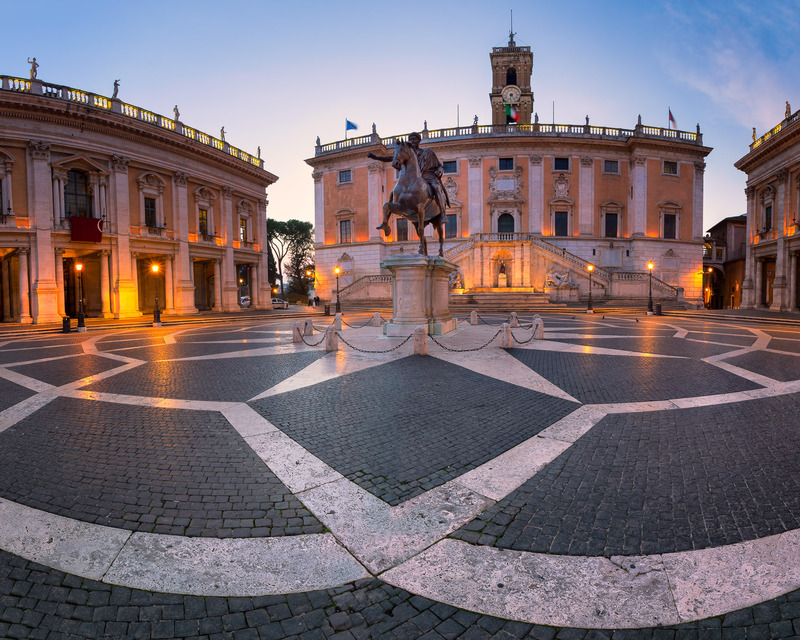 The Piazza del Campidoglio is very close to the Roman Forum and I hoped to grab some final rays of best sunrise light with this photo of Emperor Marcus Aurelius. I still needed to rush to get there in time, and this is always a little nerve wrecking to try to run from one photo to shoot to another. Despite my rush, I think this photo has a calm and meditative feel to it that captures the essence of Piazza del Campidoglio quite nicely.